A good vegetable omelet is one of the comfort foods my husband and I both enjoy. Of course, you don’t have to limit it to vegetables. Some folks don’t consider this a meal without meat. So if you have bits of meat left over from last night’s dinner, toss it into the mix. I enjoy an omelet for a weekend brunch. Although this is typically when we have it, there are times when we decide to serve breakfast food for dinner. 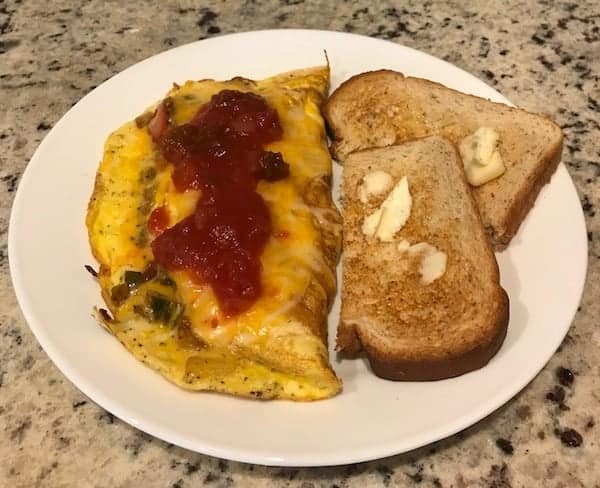 In order to get our daily servings of veggies, we opt for a vegetable omelet that we serve with toast—made with wheat bread for him and gluten-free for me. We enjoy spreading pumpkin butter on the toast for extra deliciousness. 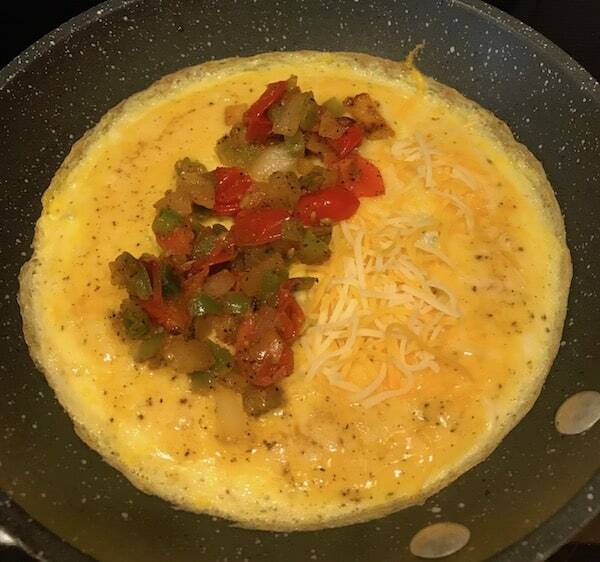 Regardless of what time of day it is, a vegetable omelet is the ideal meal. Equally important, you can serve as many or as few people as you need to. As I started thinking about what vegetables to put in the omelet, I realized that almost any veggie works. Most of the time, I go the traditional route and use peppers, onions, and tomatoes. However, there are so many others you can use. Green beans—French cut will be delicious and add a delicate touch. Carrots—Diced or julienned are best if you steam them first. Spinach—Chop and sauté the spinach first for the best results. Olives—Sliced olives straight from the can add a delicious touch to any omelet. Mushrooms—Slice a handful and toss into the omelet to add an earthy flavor. 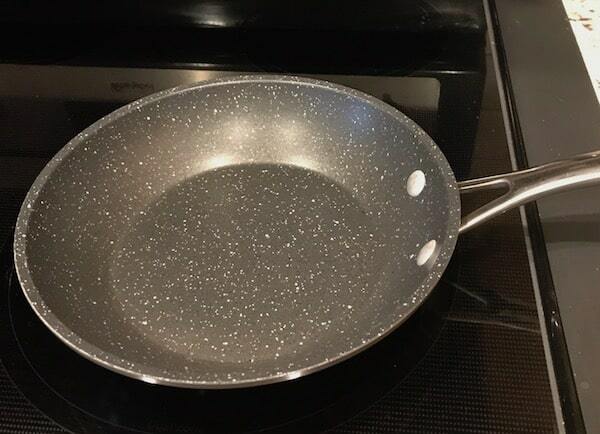 Most of the time, I like to use the smallest pan that suits my needs. 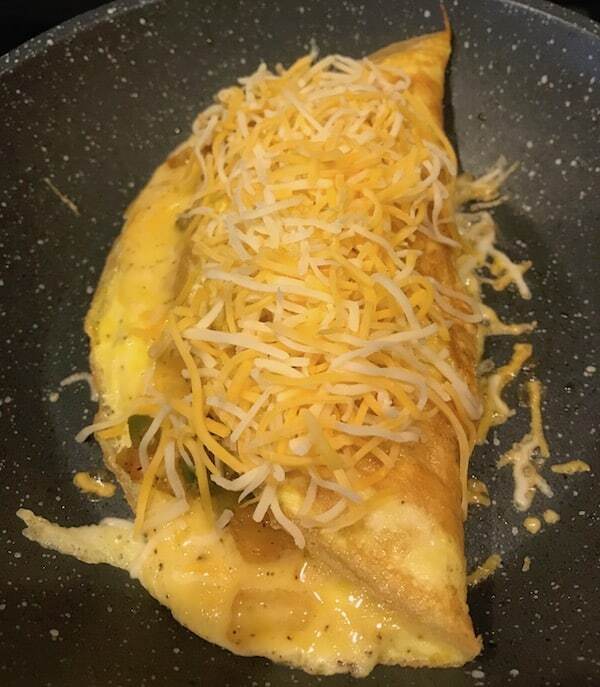 For this omelet, I used my 8” pan. I measured out the frozen diced onions and peppers. Saute the frozen vegetables. Then I diced some tomatoes and measured some shredded cheese. Next I cracked the eggs and whisked them. If you like your eggs fluffier and lighter, add a tablespoon of milk or cream. Pour the eggs into a hot skillet. Since mine is nonstick I didn’t add butter. 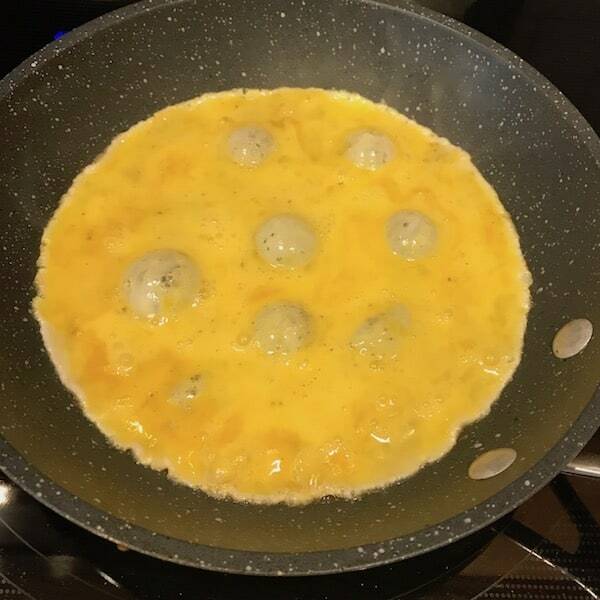 However, if you’re concerned about the eggs sticking, use butter or nonstick cooking spray. Pour eggs into the pan. 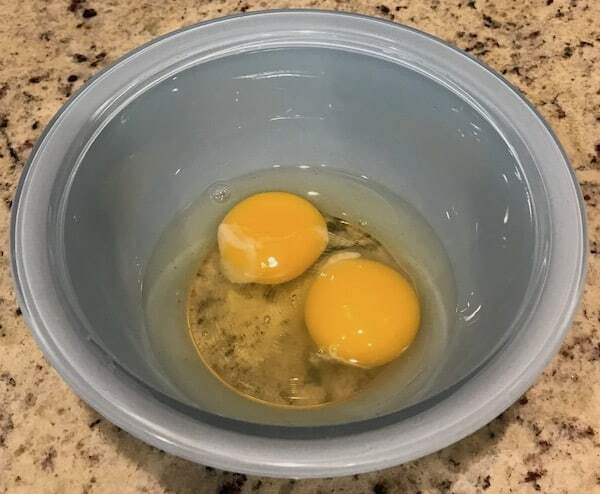 After the eggs cook for a few seconds, I put a lid on the pan to help things along and make the process go more quickly. 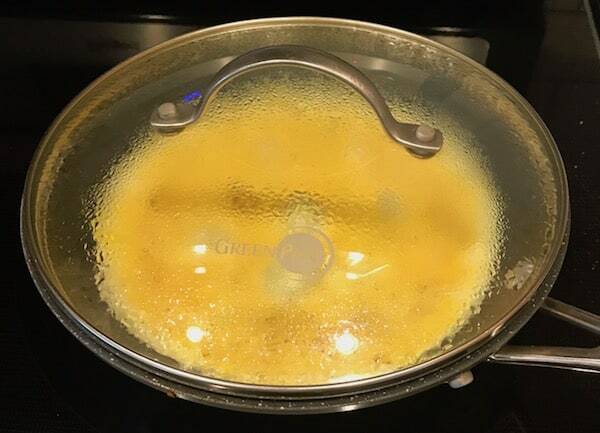 Put lid on egg pan. Once the eggs are almost done on top, I take the lid off and add the veggies on one side. After all, it wouldn’t be a vegetable omelet without the goodies. I put about a third of the cheese on the other side to help everything stick together. With attention to keeping the eggs intact, use a small spatula and carefully fold the omelet over on itself. Add the rest of the cheese and let it melt. You can put the lid back on to keep the heat in the skillet. Once the cheese is melted, carefully transfer the omelet from the skillet to a plate. Add whatever topping you like. My husband and I like various types of salsa. Finally, add some buttered toast, and you have a delicious, nutritious meal. If you decide to have a few friends over for brunch, why not serve vegetable omelets? You can have a variety of fillings for each person to choose from and make them to order. Whether your guests want onions and peppers or tomatoes and mushrooms you can make them all happy. One of the beautiful things about a vegetable omelet is that it is so quick and easy to prepare. You can generally cook one in less than ten minutes start to finish. Not only will you have a meal on the table quickly, but also your guests will be satisfied with a delicious brunch or dinner. All things considered, you’re serving a well-balanced meal that is delicious and beautiful. As long as you have eggs, cheese, and a few vegetables on hand, you can serve this dish. It’s especially good when served with banana nut muffins or pumpkin muffins. This quick and easy vegetable omelet will satisfy even the biggest appetite. In a nonstick skillet, saute the onions and peppers on medium-high. Add the diced tomatoes and cook for about a minute. Crack the eggs into a small mixing bowl and whisk until frothy. For a fluffier omelet, add a tablespoon of milk. Pour the eggs into the pan and cook on medium heat. Cover the pan to speed the process. Remove the lid and pour the cooked vegetables onto one side of the omelet and approximately 1/3 of the cheese onto the other side. 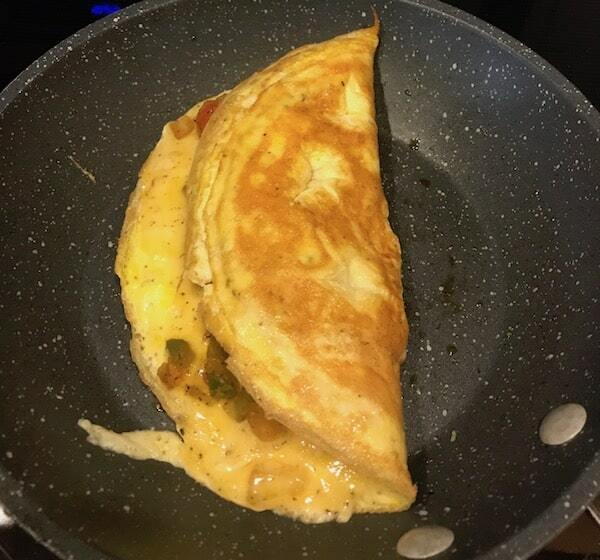 Carefully fold the omelet over itself. Top with cheese and let it melt a little bit. You may put the lid back on to help things along. 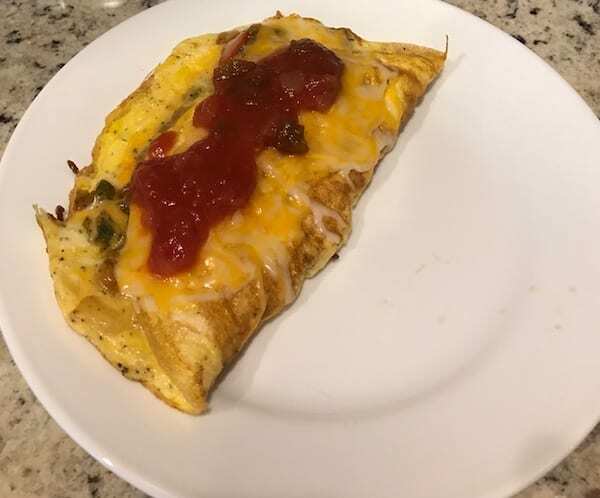 Transfer the omelet to a plate and top with salsa. Serve this delicious omelet with hot buttered toast, biscuits, or fresh fruit. I love omelets any time! They’re one of my comfort foods. I hope you enjoy it!